Widely recognized as a pioneer of the Indian ceramic industry in India, Mr. Sandip Somany is the Vice Chairman & Managing Director of HSIL Limited, the leading building materials company in India. An entrepreneur at heart, he joined the family business in the year 1982 and is the driving force behind the company today. He brought with him freshness in the company's thinking, evaluated the market needs and gradually changed the face of HSIL from being just a sanitaryware manufacturer to a home solution provider. It was under his leadership that HSIL invested significantly into glass technology and acquired AGI, Krishna Ceremics, Raasi Ceramics and then Garden Polymers. In tune with the company's new vision of providing customers with a quality of life as per global market trends, branching out into premium kitchen products, luxury sanitaryware and faucets, consumer products, etc. Recognizing his pioneering initiatives in the field of glass and sanitaryware, Mr. Sandip Somany was the President of PHD Chamber of Commerce and Industry in 2012. He is the former President of International Chamber of Commerce India chapter (headquartered in Paris), Chairman of Indian Council of Sanitaryware Manufacturers (INCOSAMA) and member of the Executive Committee of FICCI and Governing Council of All India Glass Manufacturers Association. Mr. Somany holds a degree in Engineering from the prestigious University of California, U. S. A. and has a Bachelor's degree from the Delhi University. Greatly inspired by her father and founding Chairman, Dr. Prathap C Reddy's mission to bring healthcare within the reach of every individual, Sangita Reddy formally joined Apollo Hospitals in 1983. 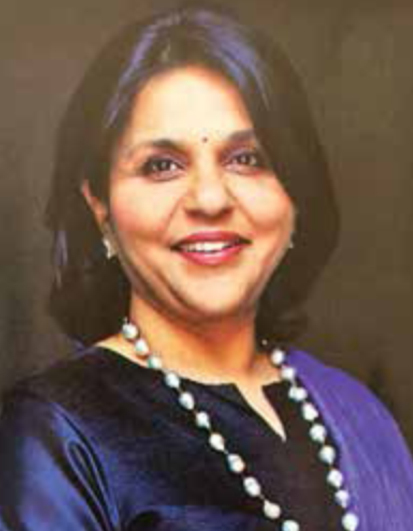 Currently, Ms. Reddy is the Joint Managing Director of the Apollo Hospitals Group. Widely acknowledged as the pioneer of private healthcare in India and a proponent of integrated healthcare, since its inception in 1983, Apollo Hospitals has touched the lives of over 50 million individuals from 140 countries. Passionately committed to transforming healthcare using effective and efficient technology, Sangita has steered Apollo Hospitals to harness technological advancements in accelerating positive transformation and using Telemedicine. She was also instrumental in the group's retail and primary healthcare expansion, leads the Human Resources and Education initiatives of the group and led a partnership between Apollo Hospitals and the National Skill Development Corporation. She was on the World Economic Forum's Global Agenda Council on Digital Health and was nominated by the Government of India as a Member of the Technology Development Board, Department of Science and Technology. She is an Independent Director on the board of many companies and was a member of the Rockefeller Working Group focused on the private sector's role in global healthcare. Sangita Reddy graduated in Science with Honours from the Women's Christian College in Chennai, India. She then did her post-graduation courses in Hospital Administration from Rutgers University, Harvard University and the National University of Singapore (NUS). Sangita was conferred with the Honorary Doctorate by Macquarie University, Sydney, Australia. Uday Shankar is the first ever Indian media and entertainment executive to assume the leadership position in a national industry chamber like FICCI, which is also the oldest in the country. He is currently Chairman and CEO of Star India and President of 21st Century Fox Asia-Pacific (Only Asia). Mr Shankar has recently been appointed Chairman, Star and Disney India and President of the Walt Disney Company, Asia-Pacific, a role that he will take over after the takeover of 21CF by Disney takes place. A trend-setter in the media and entertainment industry for over two decades, he played a leadership role in making Star India one of the largest Media & Entertainment companies in India, reaching over 720 million viewers a month across the country and more than 100 other countries. Mr Shankar has been a leading voice in the Indian media and broadcasting sector, shaping reforms for the industry and its consumers. As Chairman of the FICCI Media & Entertainment Committee and former President of the Indian Broadcasting Federation, he has been at the forefront of landmark changes in self-regulation and pushing access for consumers to the digitized distribution. Mr Shankar entered media as a political journalist with The Times of India and rose to become the CEO and Editor of 'Star News' after' spearheading the successful launch of country's first 24-hour Hindi news channel 'Aaj Tak' in 2000, and 'Headlines Today' in English in 2003, as Editor and News Director of the TV Today Group. Mr Shankar holds an M. Phil in Economic History from the Jawaharlal Nehru University, Delhi. He is an avid reader and his knowledge domain transcends from literature to politics, economics and sports. Rashesh Shah has spent over 25 years in the corporate and financial markets sector and is one of the leading spokespersons for the industry. Rashesh started Edelweiss in 1996 that has since grown into one of India's leading diversified financial services conglomerates.The INR 270 billion Edelweiss Group is present across all significant areas of financial services including Credit, Housing Finance, Financial Markets, Commodities, Asset Management and Life Insurance. The Group has 240 offices in 125 cities, including eight international offices in New York, Canada, Dubai, Hong Kong, Singapore, Mauritius, Nigeria and Chad with headquarters in Mumbai, India. Rashesh is passionate about financial services and the role it can play in translating India's vast savings into investments; thereby powering economic growth and development. Under his leadership, Edelweiss has combined technology, innovation and growth oriented entrepreneurship with a strong focus on risk management to become one of the more successful, stable and well respected financial services companies in India. A regular commentator on macro- economic policies, development matters and financial markets in the mainline and financial media, Rashesh serves on the Boards of various companies and public institutions. He has previously been on the Executive Committee of the National Stock Exchange and also on the SEBI (Stock Exchange Board of India) committee to review Insider Trading Regulations. He currently serves as Chairman, Maharashtra Council of FICCI and is a part of the Directors Forum formed by corporate stalwarts under the aegis of the FICCI Center for Corporate Governance seeking to improve the quality of board-level governance in Indian industry. An MBA from Indian Institute of Management, Ahmedabad, Rashesh also holds a Diploma in International Trade from the Indian Institute of Foreign Trade, New Delhi. A voracious reader, a fitness enthusiast and an avid runner, Rashesh has recently participated in a triathlon and continues to participate in marathons across the globe. Dilip Chenoy is currently Secretary General, FICCI. His last full-time assignment was when he served as Managing Director & CEO of the National Skill Development Corporation (NSDC). NSDC is a public-private partnership whose objective is to foster private sector investment and initiatives in training and skill development. While at NSDC he served as co-chair of the Australia-India Joint working group on Skill Development. Currently, Mr Chenoy is a member of the Board of Governors, IILM, New Delhi (a leading business school); of the Board of studies, All India Management Association (AIMA), He is also Director General of ICC India, and of Indian Council of Arbitration (ICA). He advises start-ups including organisations in the digital, education, skills and livelihood space. He also serves on the Executive Committee of Bureau of Indian Standard (BIS) and is a Director of Invest India. He has served as the Chairman of Sant Longowal Institute of Engineering & Technology (SLIET) a fully government funded integrated skill development and degree-awarding institution. He was awarded the Indian Achievers Award in 2018; The Game Changer Award in 2015 and the Rashtriya Media Ratan Award in 2013. Prior to NSDC, Mr Chenoy was Director General of the advocacy group for the automobile industry in India, Society of Indian Automobile Manufacturers (SIAM). He also served as the Deputy Director General of the Confederation of Indian Industry (CII). He was a member of the Harvard Business School project that worked on the competitiveness of Indian industry with Professor Michael Porter. He is a fellow of the World Academy of Productivity Science (WAPS).